Just four months after the death of Peter Hallock, founder of the Compline Choir in Seattle, we mourn the passing of Carl Crosier, Peter’s business associate and chief executor of his estate, who died on August 28. 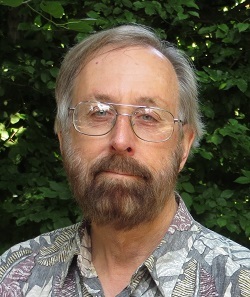 Carl heard Compline as a student in Seattle in the 1970s, and, after leaving the mainland to work in Hawaii, formed a choir at the Lutheran Church of Honolulu to sing the service. Carl retired as director of this choir about three years ago, and I did a feature on the Honolulu connection in January of 2012. Since then, the service has been discontinued, but I’m still keeping an opening for Hawaii on this blog’s new tab, “Where to experience Compline” as a reminder that this was the first of many choirs modeled after Seattle’s Compline Choir. “In 2000, the Compline Choir made a trip to England; it wasn’t an ordinary choir tour, but rather a pilgrimage to celebrate the fiftieth anniversary since our founder and director, Peter Hallock, had been a student in Canterbury at the Royal School of Church Music. 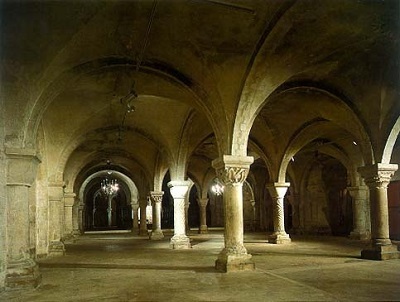 It was in the crypt of Canterbury Cathedral that Hallock and his fellow students would sing Compline, mainly for the benefit of hearing the chants resonate in the wonderful subterranean space. When we visited Canterbury Cathedral we sang our office of Compline in the choir stalls of the Cathedral for the general public. As the service progressed, I recalled that Canterbury was founded by monks, and that Compline would have been sung every evening in this place, with the same chants, over 900 years before. It seemed as though the same spirit passed from those ancient voices to the students in 1950, and through Peter Hallock to us, and on to many choirs throughout North America. Having completed Compline, we had arranged in advance to process down to the crypt, where we would sing, just for our own group, one of Peter’s anthems. I was reminded of the medieval custom to process to another chapel after Compline to sing a special anthem, and felt again a connection to those that had gone before. [We processed two by two, with Carl and I leading our respective columns.] We walked silently past the altar, marking the spot where Thomas Becket had been murdered in 1170, then downstairs to the crypt. We gathered in the middle of the chamber, under the low stone arches, in the final resting place of many of the saints. I thought of the columbarium in the crypt of St. Mark’s in Seattle, where the remains of friends and acquaintances lie. We had arrived at our pilgrimage destination. Into the house and gate of heaven. It was only years later, in writing this book, that I sought out Donne’s sermon<1>, and found out how much it says about life and death. The sermon that Donne preached that day was on Acts 7:60: “And when he had said this, he fell a sleep.” Lent had just begun, and Donne began his sermon by saying “He that will dy with Christ upon Good-Friday, must hear his own bell toll all Lent.”<2> The verse from Acts comes at the end of the life of Stephen, the first Christian martyr, whose last words, as he was stoned to death, were “Lord, do not hold this sin against them,” and then, having uttered these words, he died – or, in the King James version – “he fell asleep.” Donne seizes on this short verse of Acts to make two points: first that we must be something, answer some calling in our lives, and live out our days following the example of a person of integrity, such as Stephen [and Carl]; and second, that having done our best, we will not die, but sleep the sleep of Stephen, a blessed rest until the Resurrection. And may the souls of Carl and all the faithful departed rest in peace. Amen. <1> John Donne, “A Sermon Preached at White-hall, February 29, 1627 [1627/8],” in The Sermons of John Donne, vol.8, no. 7, edited by E.M. S. Simpson and G. R. Potter, (Berkeley: University of California Press, 1956; digital publisher Brigham Young University, 2004-05). This entry was posted on September 1, 2014, 9:02 am and is filed under Uncategorized. You can follow any responses to this entry through RSS 2.0. You can leave a response, or trackback from your own site. Ken, Les and I have been out of the state (and out of touch) so this is the first time I’ve heard about Carl’s death. I am so sad, having seen him so recently at Peter’s home. The article, the link to the Compline’s singing, your tasteful and warm words are all perfect. He was a fine man and so are you – it’s good to know you. Please keep up the good work! Thanks, Laura, for your kind words. And in connection with Compline, it should be mentioned that although Carl was the first person to start a choir modeled after that in Seattle, Leslie Martin was the second, and the Compline service begun in 1985 at St. David’s Episcopal Church in Austin, Texas, is now the longest-running Compline service after St. Mark’s. I believe the very first Compline Choir following on St Mark’s was at the University of Redlands, Redlands, CA about 1962. Being a So Cal boy, this was my first exposure to Compline. I sang with that choir for 3 years, and then when I went to serve as priest at St Andrew’s Cathedral, Honolulu, I met Carl and sang with their choir for it’s first 3 years. Carl was a good friend and I was privileged to be one of the 3 clergy to officiate at his marriage to Katharine Au. I feel very sad at his passing. Thanks, Curt, for your comment. I would love to know more about Compline at U. of Redlands, such as how often it was done (weekly? ), whether it’s always been a function of the Chapel Choir, and who started the service. From the choir’s website (see the tab “Where to experience Compline”) a regular service of Compline is not listed. I.m a bit confused about WHERE to reply, but here goes. This experience of pictures, text and music, simultaneous, has me very impressed. Peter’s exquisite music is most touching.